PTNA has just announced the rules and required repertoires of the PTNA Piano Competition 2018. Prior to the regional preliminary rounds which will start in May, plenty of events are scheduled to take place. On March 24th, public recording concert of the repertoires will be held in Tokyo. 4 pianists (PTNA performance members) will play Baroque and Modern pieces chosen for the grade A1-C. Audience may be able to find beautiful interpretations and explore what kind of expressions they would like. The following 4 pianists will be on stage; Kyoko Kaise (PTNA Gold Medal-second place 2004, 1st prize at the Music Competition of Japan 2005), Nozomu Sugawara (PTNA Grand Prize 2012), Takuya Tainaka (PTNA Bronze Medal in 2005, 2013), Aiko Tominaga (PTNA Silver Medal in grade G in 2005, 1st prize Music Competition of Japan 2008). On March 25th, the winners concert of the PTNA Piano Competition 2017 will be held in Tokyo. There were 45,935 participants in total last year, throughout the preliminary to the final round. Here is the program of the winners' concert (in Japanese). Furthermore, various seminars and demonstration lessons of the required repertoires will be scheduled across the nation. There are some changes and revisions for the competition this year. In the grade superior, 1) the final round will be held at Suntory Hall for the first time ever since this competition established in 1977. Correspondingly, the entry fee and prize money of the grade superior will be revised. 2) Prerequisite to the grade superior will also be changed. 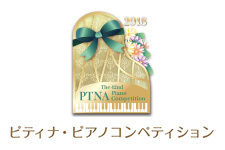 Those who had already participated in the PTNA Piano Competition before are eligible to apply. 3) The 3rd round will be added before the semi-final recital round, in which participants (10-13) play concerto with piano accompaniment.